We had a good feeling that the Apple iPad event invitation would be released today, and we can tell you that they have now been sent out to certain bloggers and media. There is the hope that Apple will have a live video stream of the event like last year, but we cannot be sure of this because they did not offer this coverage last month. Last month’s event was the biggest of the year for the company, but not in terms of new products. However, it will be a different story for the iPad event because there will be a host of other devices being released — or so we hope. Looking at the Apple event invitation below, thanks to The Loop, we can see the date is October 22, 2013 and the time as usual is 10am PT, or 1pm ET or a start time of 6pm in London. While there does not seem to be any clues within the invitation, we do have one thought. On the invite it states they still have a lot to cover; now does this mean we could be looking at a larger iPad, or even a return to a 17-inch MacBook Pro? However, because this will be more of an iPad event, and the MacBook Pro 2013 refresh being an added bonus, an iPad with a larger display and new larger Smart Cover does seem more likely, although we assumed this would not happen until 2014. 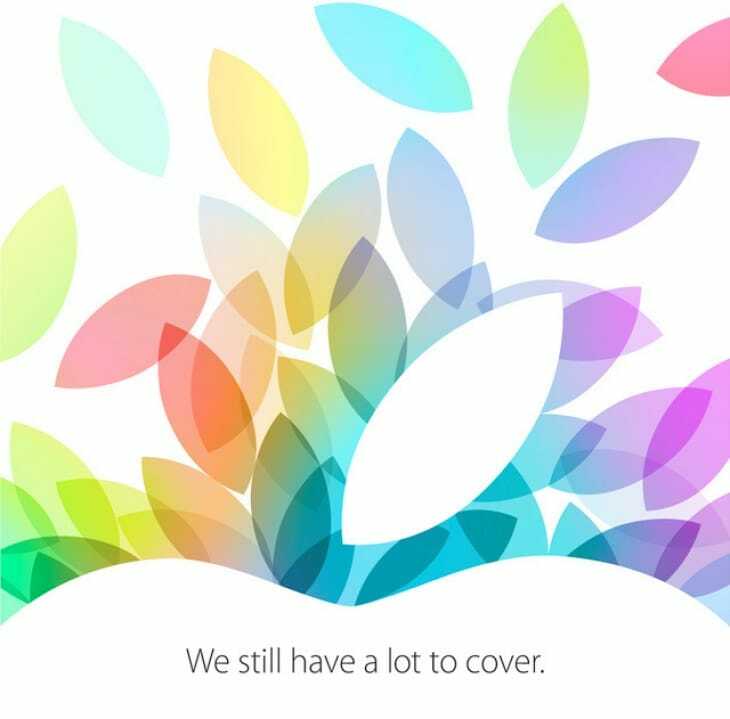 On the other hand, the invite does look more like autumn leaves falling onto the ground, which means this is just inspired by the fall season, and the fact that Apple will have a multitude of products to unveil, such as the iPad 5, iPad mini 2, 2013 MacBook Pro and Mac Pro, a Haswell Mac Mini, Mac OS X Mavericks and iOS 7.1. What do you think Apple will unveil next week?